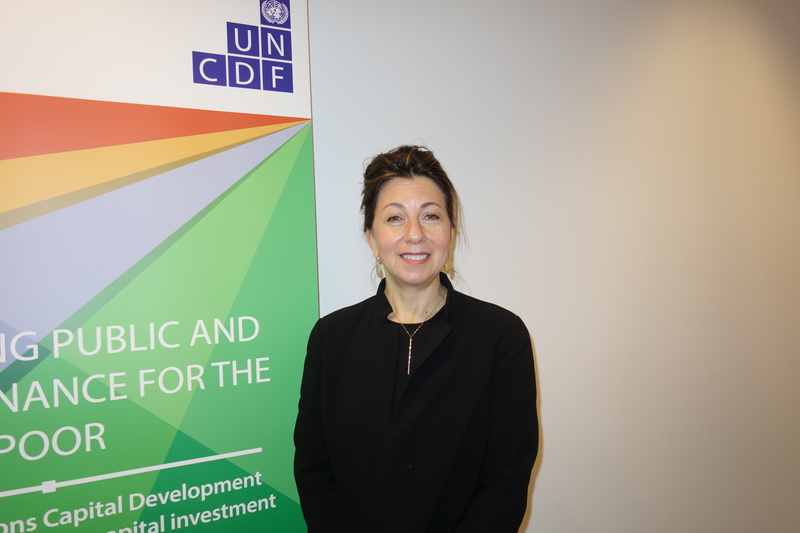 Judith Karl has served as the Executive Secretary of UNCDF, the United Nations Capital Development Fund, since 2014. For over 25 years, she has worked in international cooperation, development and poverty reduction. Karl spoke with Senior Editor Georgi Gotev. Can you describe what the UNCDF is doing? The United Nations Capital Development Fund UNCDF has been in existence since the 1960s as part of the UN system, administered by the UN Development Program UNDP. We are an independent capital fund. We were established for the purpose of providing financial ability to implement and use financial instruments that the rest of the system cannot do. We have a mandate and the ability to get block grants, loans and guarantees to government and private sector entities, to address issues where financial markets and the flow of investment are not serving poor people, where finances tend to restrict themselves to areas where investors are confident that they will get a return on their money. Investors’ money usually stays in capital cities, in safe investments such as real estate, commodity markets. It doesn’t tend to flow down to the local economic level and reach poor households. The Capital Development Fund is working with our financial instruments to help finance work for the poor, to bring finance down to the local level, and to address structural failures in both public sector finance and private finance. So that the poor people can become part of the financial systems, and the economic growth of their countries. Can you give examples of when the UNCDF has been able to attract finance from funds that usually play it safe? Our mandate is to work primarily in least developed countries. I will refer to the case of Tanzania, where we are working with provincial governments, to see what infrastructure plans are in their provincial development plans that they cannot get financed through international financial flows, through government channels, or because private banks are not lending to governments. But these types of infrastructure projects are those that can help drive economic activity and form the backbone for households to be able to engage in livelihoods and employment opportunities. They can be feeder-roads, they can be warehousing facilities to improve local food security, they can be transport hubs, they can be hydropower plants. Take the example of a small hydropower plant that will help local communities and farmers. What we do is that we use our capital to de-risk the investment, to help to get a financial package together that would be attractive to a local bank, and to help create a management architecture between the local government and sometimes a private or non-profit entity. We make it a bankable project. With a $250,000 investment from UNCDF in this particular project, we were able to attract a domestic bank to finance about $15 million. And once you multiply those projects, by the end of this year we aim to close $100 million in that type of investment in local infrastructure in Tanzania, then you begin to create a new mentality that says it’s not so risky to invest at local level. And from there we build the national platform that helps the country establish the capacities to do that across many different provinces. UNCDF is also active in providing financial services for the poor. Can you tell us about those projects? Indeed, we are working at the intersection of getting local infrastructure up and running to form the backbone of local economy, and then getting households access to participate more actively in the local economy. We work very much in the area of financial inclusion, and that is to address the two billion or so global population that is unbanked. That is, people who don’t have access to bank accounts, do not have access to saving accounts and therefore do not have access to the range of financial services that can help them engage in the economy. Mobile technologies have provided a leap forward, giving us us access to hard-to-reach populations. So we use mobile technology and we have an active programme called “Global money for the poor” that uses mobile technologies to link up with financial service providers, actually private service providers that can link up with the formal banking sector, with the telecommunications companies and find different ways to extend financial services out to these unbanked populations, to provide them with the ability to save and manage their household finances in a way that supports resilient households, that supports women’s management of their household budgets. This means more girls going to school, and women being able more to engage in economic activities. It also means that we can build the capital base of the financial service sector from the savings that exist, and from there provide credit for the entrepreneurs and other forms of agricultural and smallholder farmer activities, and a full range of financial services including micro-insurance and other services poor people need to survive the annual cycle of their financial lives. Have you seen some success stories yourself? Yes, many! Perhaps the most interesting is under the Pacific inclusion program, that is funded by the EU, as well as Australia and New Zealand. In Fiji and in the Solomon Islands, which are areas with very complex geographical challenges, with people living on island in very remote areas. We have seen very substantial increase of numbers of access. In 2014, we see the Pacific program reaching a total of 556,000 mobile money subscribers and over 390,000 depositors. These are new entrants to the formal financial sector, who now have the ability to get their money out of their mattresses, put it in a safe bank account, and access other financial services. You mention this program being co-funded by the EU. What other synergies exist between the EU and the UNCDF? We have a very strong program with both the EU, and with the government of Belgium, which has been a longstanding supporter of UNCDF. Together with the EU, we are working on the localisation of finance, to build the backbone of the local economy as I explained in the beginning. The EU has been an important supporter of our program in Bangladesh. The other area is financial inclusion. The EU is a strong supporter of a number of our programs, including the programs I already mentioned. So the EU is an important part on both sides of the work of UNCDF, on local infrastructure and on financial inclusion. How important are remittances for the least developed countries, the money families receive from family members living abroad? One of the biggest issues with remittances is that they are a major driver of receipts at household level, but also the system for transfer of remittances can be very expensive, for the sender and for the recipient. Yes, definitely, like Western Union. And a lot of the discussion around the remittances is what systems can we find that will make them not only less expensive, but also ensure that the receipt of the remittances is more linked to these types of more formal financial services that actually allows better management of that money. Frequently remittances will be received, recovered in cash at a great expense to the household that is recovering it, so the use of mobile money is also a very important way for the household to access the money. In the Pacific, we found families who have to travel an entire day just to be able to get to the bank, or for welfare payments from governments. Another important aspect is the transparency of the money flows. We are part of a network of partners including organisations like IFAD and others, working also as an implementing partner to the G20 Global partnership on financial inclusion, to look at new forms of remittance payments to be developed. We work very much right now on households that are receiving the remittances, to be able to get less expensive access to those resources and use things like e-wallets and other digital technologies, to be able to save those resources and connect them to the formal banking sector.